Our Romance Teak Bench is individual and eye-catching in its hand-made and unique design. With a curved back rest and seating section supported by a wide, double panel leg structure with chunky bottom stretcher it is not only attractive but unique at the same time. The quality of the teak is second to none and this produces a lovely golden-brown, smooth finish with the grain highlighted to stunning effect. The construction is solid as well with mortice and tenon joints reinforced with teak dowels securing the whole thing making it perfectly suited to regular use without developing that annoying wobble. Over time the teak will turn a silver-grey as the ageing process takes effect – for cosmetic purposes the honey lustre of new teak can be maintained by using our range Golden Care Products. This is purely for cosmetic purposes though, the dense, oily nature of teak wood offers it natural protection against cracking or splitting with the elements over time. If you like the silver-grey colour that develops through ageing then external products are not needed – just let the wood look after itself naturally. 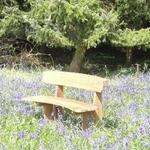 For further information about our Romance Teak Bench please call our Showroom in the Midlands.